The latest official statistics on drug-related deaths in England showed the highest number of substance misuse related death since these records began and highlights a worrying rise in the number of older, more vulnerable drug users dying from heroin overdose. Alongside this trend, alcohol-related hospital admissions have risen with over 300,000 in 2013/14 and smoking is still one of the leading causes of premature death in England, causing nearly 80,000 deaths a year. Clearly, the health harms from alcohol, drug and tobacco use are concerning, but these issues are not the same across the country. Local areas face different local challenges; from an ageing population of drug users, certain groups using ‘club drugs’ and new psychoactive substances or younger people binge drinking. There are, of course, many reasons for this and often the areas that suffer the most from alcohol, drug and tobacco harms are those that tend to carry the burden of wider health inequalities, compared to other areas of the country. Public Health England (PHE) has an important role in supporting local authorities with their responsibility for commissioning tobacco control, as well as alcohol and drug interventions and services. In terms of local need, it’s crucial that the response is bespoke and should include commissioned services that are tailored to fit specific, local circumstances. This new series of support products are designed to do just that. 1. A series of good practice evidence-based prompts to help local areas assess need, plan and commission effective services and interventions. The evidence shows that effective local systems are those that are coherently planned in partnerships between local government, the NHS, community services and crime and justice partners to provide clear and integrated pathways via levels of intervention based upon the identified need. Planning according to the local landscape is key – taking into account not only the local needs but what community assets are already available, reflecting the evidence of what is known to work in terms of: effective prevention, health improvement interventions for those at risk and treatment and recovery services. The second component for each topic is a bespoke data pack for every local authority to support local assessment of need and commissioning. To fully understand local need and how effectively it is currently being met, additional local data and intelligence should be used. 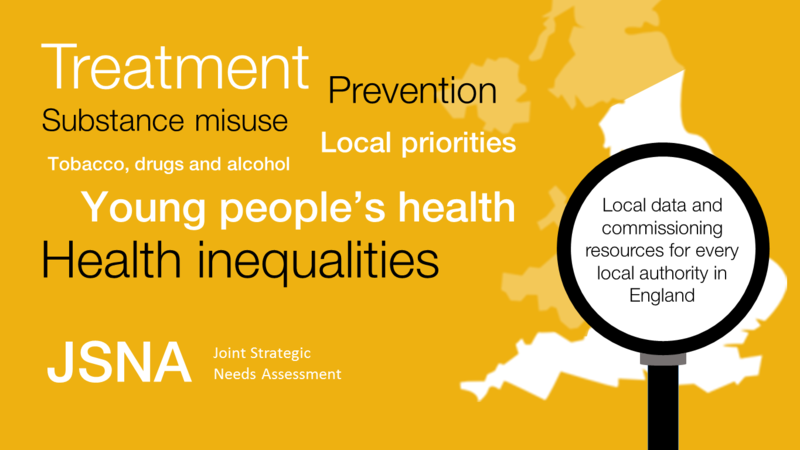 "We have found PHE's substance misuse JSNA support pack to be an essential element in the effective planning of substance misuse prevention, treatment and recovery services for our local population. Included in each pack are three data reports that are structured and presented in a clear and interpretable format which will be crucial in the production of an accessible Surrey JSNA for all stakeholders." We encourage local authorities and our local partners to use these resources to look at how their local responses meet the issues their areas face, and establish what more could be done to target groups or communities who suffer higher rates of drug, alcohol or tobacco use and harm.